Before joining our fitness camp – or any other fitness program – it’s recommended that you get approval from your physician. We’re here to help you – and getting hurt is not part of the plan. Please make sure that you get the “go ahead” before coming out to shed those pounds. Come prepared to workout. We’re at the park and there are no changing rooms, so come already prepared to bust a sweat. Wear workout shoes that are comfortable on your feet [no stilettos, crocs, or sandals]. Ladies: make sure that your bra is supportive even while under constant movement. Wear clothes that are comfortable and fabrics that breathe: sweats, capris, shorts (skorts), tank tops, etc. 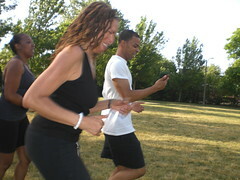 Be prompt – Boot camp takes place from 6pm-7pm, which means that THE WORKOUT STARTS AT 6PM! Arrive early to be prepared to work out on time – even earlier if you have questions. Eat clean – Eat a healthy meal approximately 1 hour before working out. In a pinch, eat a banana as late as 8 minutes before working out. 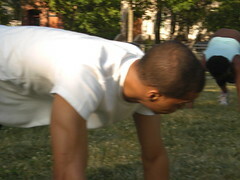 Hit the John – Boot camp takes place in a public park with no rest rooms. In order to avoid travelling a few blocks to the nearest public rest room, it’s best to “take care of business” before hand. This entry was posted on May 29, 2013 by millhoy. It was filed under Announcements .